From our neighbors across the pond comes a new take on fast food. 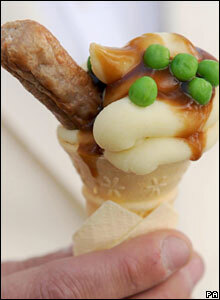 A so-called "mash van" in the UK shows off its new "mash cone" with sausage, mashed potato, gravy and peas in an ice cream cone. I'm sure all the components taste fair enough, and the not-very-sweet cake cone would be crisp-like (crisps = potato chips), but... Eh. It certainly defies the boundaries of what belongs in an ice cream cone, for which I give props! Wow...that's so strange...O_O I really wonder how that would taste. Since I like savory, I'm thinking this would be great! that is possibly the rankest thing I've ever seen!